If you know Jeremy, then you are well aware that he prides himself in caring for our yard. 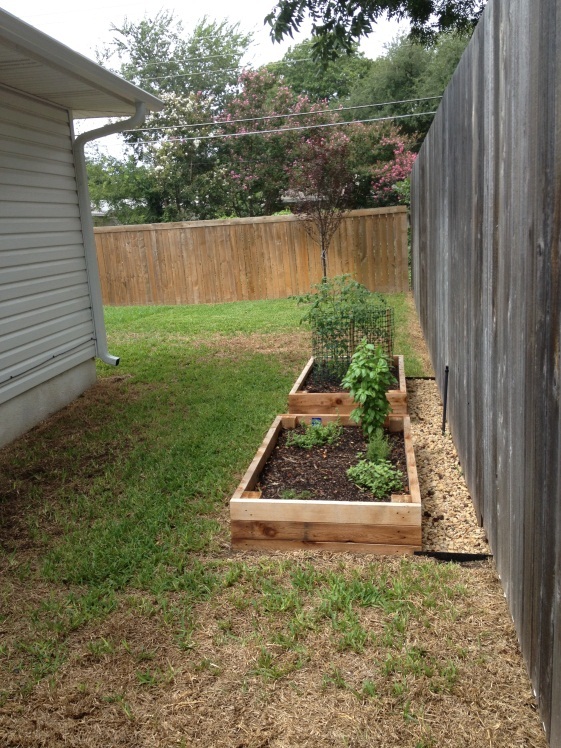 We've invested in leveling, re-sodding the back yard, plus added a couple of trees. He has worked uber hard on getting our lawn back in shape after last summer's brutal heat. A How-To Garden Building Guide to Decrease Country Burden and Boost Morale During a Full Blown Zombie Epidemic. According to the extremely accurate Wikipedia, some dude in Canada "...performed an epidemiological analysis, applying mathematical models of disease to 'biological assumptions based on popular zombie movies' and found that is likely to lead to the collapse of civilization, unless it is dealt with quickly." Canadian-zombie-research-dude concluded that offensive strategies would be most affective if we, the human race, are to survive a zombie apocalypse. 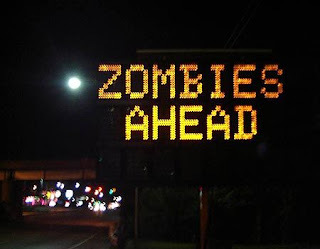 This impending zombie apocalypse threatens to breakdown society therefor leading to a shortage of food. With the world in a full blown zombie panic, people clear the stores of all food items quickly. Deliveries are unable to be made due to the growing number of zombies feasting on humans and spreading their undead disease, and your friends and neighbors find themselves starving and scared, awaiting their zombie fate. Lucky for you your offensive strategies payed off. You thought ahead and built your very own Zombie Apocalypse Garden (ZAG) using this handy guide! Zombies do not eat fruits and veggies, therefore they pose no risk to your ZAG. However, please take care when retrieving your home grown goodies because zombies sole source of sustenance and key to survival is human flesh. Not to worry, fellow Texans! YOU can play a vital role in the survival of human kind by building your own ZAG. 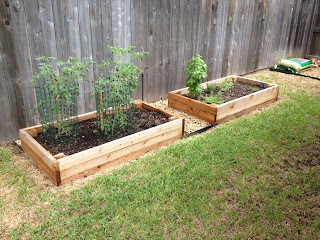 If you can keep them alive through the heat, Texas is supposed to be great for gardening since we have two grow seasons: (1) spring planting with a summer harvest and (2) summer planting with a fall harvest. We built two 5’ x 3’ raised gardens with plans obtained for free from the Lowes website. -Wood. 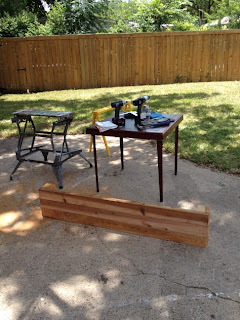 We used untreated rough-cut cedar since it resists rot (and you know how zombies like rot!) better than most wood and is relatively inexpensive. Plus the untreated wood won't leach chemicals into your soil and plants. 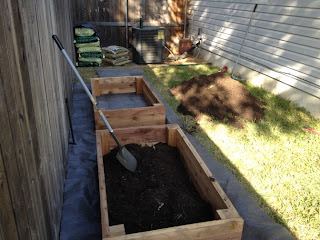 Each bed requires six 5’ sections and six 3’ sections of 2x4. 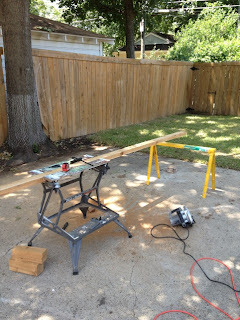 You also need four 4x4 posts cut to 10.5’’ each. 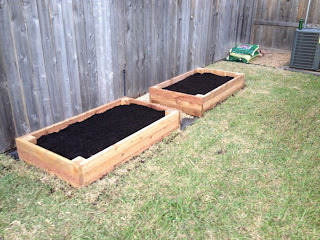 - Wood screws (about 50 per garden), landscaping fabric, and garden soil (about 3-4 big bags per garden). We also installed river rock around the garden to keep from having to mow or trim the grass around and behind the beds, cutting down on time spent vulnerable to zombie attacks. - Circular or miter saw, drill, tape measure, carpenters square, razor blade, and level. Also don’t forget shovel, wheelbarrow, rake, etc. 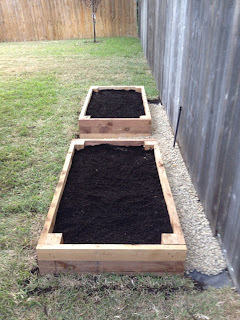 for transferring and leveling the soil. 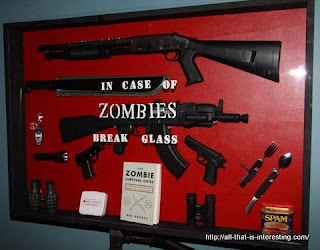 These are great because they can also be used as weapons should you need to fend off zombies while gardening. Just remember that zombies are pretty hard to kill since they are already dead. The only thing keeping them undead is the brain-thriving virus that uses it's human victim's corpse as a puppet to replicate and spread itself. ZAG tip: always aim for the head and don't be shy. Severing the head or destroying the brain is the only way to kill a zombie. In a zombie apocalypse it is not a matter of if but when you will kill a zombie. Prepare the area by first figuring out the size and shape of your garden. Our area is 12’x4’ to leave a foot of space behind the bed and two feet between the beds to allow access in all directions. Remove any grass, rocks, roots, etc. down to the layer of topsoil and then use a rake and shovel to level the area checking your work with a level, all while listening for zombies. Zombies are attracted to movement and sounds so it is a keen idea to scope the perimeter and keep an eye out before and during an activity where you will be moving a lot and making noise. They are easily distinguishable by their "aaarghhhh brahhhhhhrrr rrrrooorrrraaaahhhhhrrrrggg" moaning sounds and slow lumbering shuffle. But they run in packs. 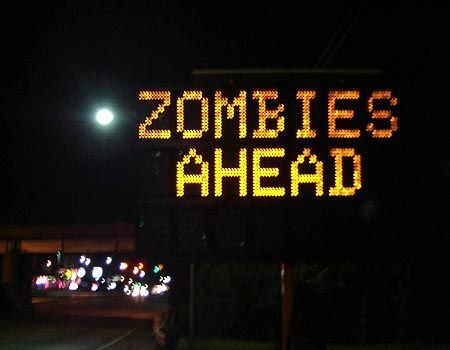 If you see one zombie there are surely to be more to follow so stay on guard. 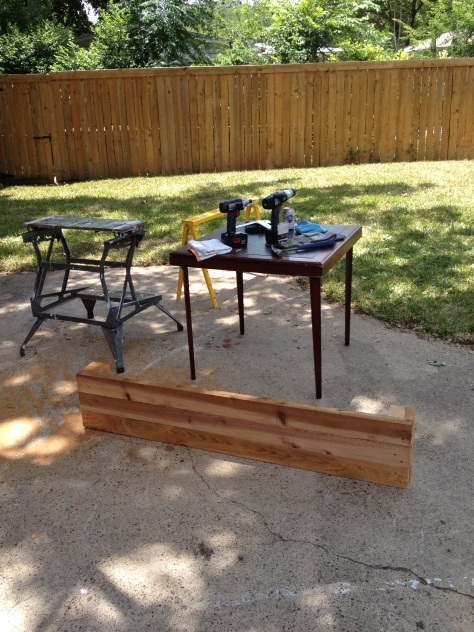 Drill some pilot holes into the edges of the 5’ 2x4s and attached them three pieces high to the 4x4s using wood screws to create a wall. Make both of the 5’ walls then attach the 3’ sides. 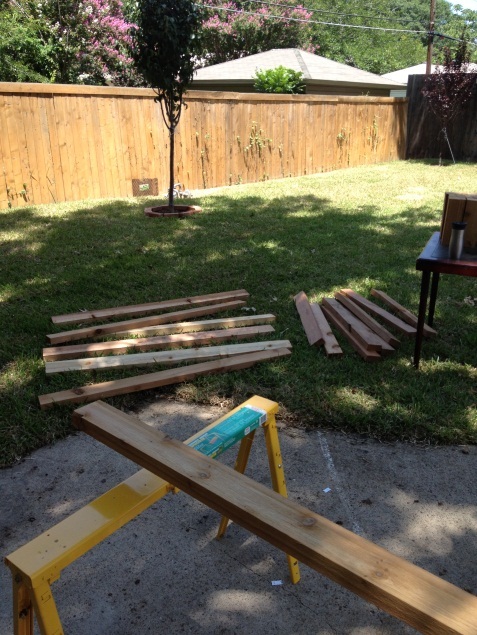 Use a carpenter’s square to ensure squared off edges. When this is done, you've got a finished bed. Repeat for as many beds as you please. ZAG tip: To decrease your chances of a zombie attack whilst making and maintaining your garden it is best to do all activities during non-rainy weather. Zombies' favorite weather is rumored to be rain. Plus power tools and water are not a good combination. 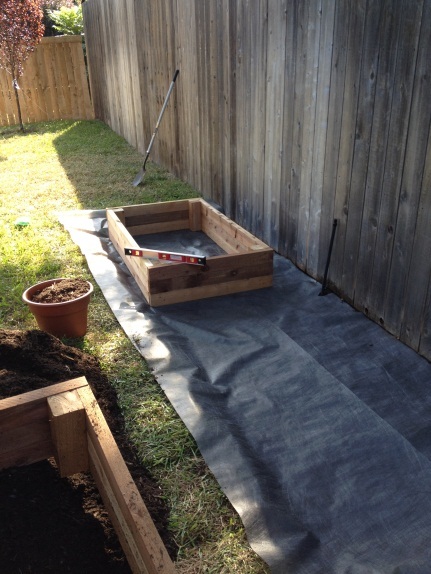 Next, lay down the landscaping fabric to help prevent weeds (and emerging zombies should you happen to build your ZAG on a grave). Position your bed(s) on the fabric, and ensure everything is level. Keep in mind this won't keep the zombies from tearing through the fabric. However, it will provide an extra barrier that they will have to work through, increasing your chances of hearing them and buying you more time to prepare for battle. Mostly it's good for keeping weeds out. After placing the beds and leveling you can start filing said beds with garden soil and use your razor to cut the landscape fabric to size. Add any edging you want. We used a mostly invisible pound-in edging then filled in the pathways with river rock. Neither of this has anything to do with zombies, we just liked the way it looks. Once you have established your ZAG and have made it through a bountiful harvest it will be in your best interest to preserve some of your fruits and veggies by canning them. These canned food items should be kept with your Zombie Emergency Kit should you not be able to tend to your ZAG or if you have a poor harvest. This is the most important ZAG tip: if your loved one is bit by a zombie they have approximately three days until they are a full blown zombie, at which time you must kill them by severing their head and/or destroying their brain. Remember, they are dead. They will have no recollection of or emotion for you or any one else. Their sole purpose is to feast on human flesh and propagate the virus that has taken over their dead bodies. Aim for the head. There you have your complete ZAG guide! Play your part in the war against the hypothetical human killing virus that highjacks dead bodies to feast on more humans, ultimately killing the human race so that it may mutate into harvesting on other living creatures to keep itself alive. The human race is counting on you to hold down the home front. Now go grow some fruits and veggies!! I was rooting for calling our new garden the Victory Garden. It's cute and nostalgic. Plus it reminds me of the garden American Girl Molly had while her father was fighting in WWII. See, those are the types of books I read when I was in second and third grade. I steered clear of Jeremy type books with violent plagues that feasted on humans, killing family and friends and using their dead bodies to spread the infection by biting, killing, and turning the victims into one of them. That's the difference between Jeremy and me; I'm drawn to stories of the realities of every day life in present and in history, while he loves the world of theoretical probable science fiction. I've come to appreciate this world of science so much more since he has held my hand through it and opened my mind to the limitless creativity it entails. Plus we get live everyday stories of tough times and good times. We are writing our own happy ending with our lives. We might as well have fun writing some science fiction with our minds. 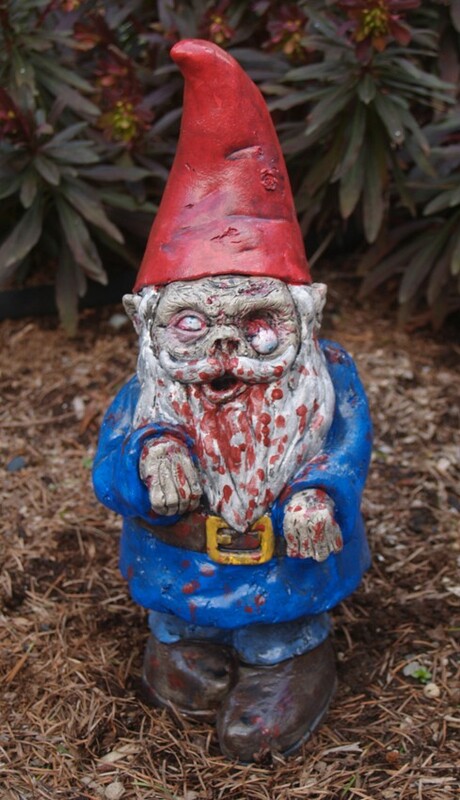 ps- We do not and will not own the zombie garden gnome pictured above, but if you are interested I found it here. "I'm drawn to stories of the realities of every day life in present and in history"
Tamara, I'm surprised you could utter this with a straight face while wearing your official "Fifty Shades of Grey" ball-gag. Remind me to set the comment section to "monitor must approve before comment is posted" when you get home.